General Hospital (GH) spoilers tease that a dark cloud will hang over Sam (Kelly Monaco). She’ll struggle to find any hope in this tough battle. Sam desperately wants Jason (Billy Miller) to awaken from his coma and come back to his family. She needs a chance to make more memories with the man she loves. Unfortunately, the situation will remain grim over the next couple weeks. General Hospital spoilers indicate that Sam will have to make a brutal decision on September 18. She’ll have trouble knowing what the right move is. GH buzz hints that Sam will ultimately decide to place Jason in an institution. His grim prognosis will force Sam to face the facts. She’ll worry about adjusting to a Jason-less life. While Jason gets set up for long-term care, Sam will begin to fall apart. Her loved ones will grow increasingly concerned about her well-being. There are a couple of issues we should talk about here. Steve Burton’s (ex-Jason) return date is supposedly set for September 18 as well, so some major drama is about to hit. It’s interesting that GH is taking current Jason out of the picture right as Burton’s character reappears. 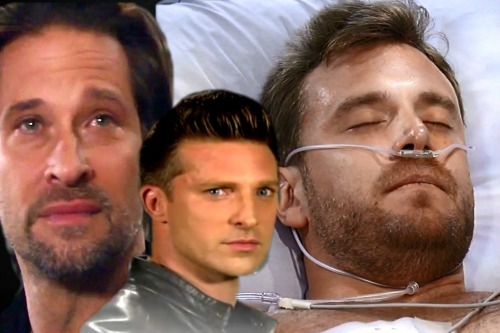 Billy Miller may have been working out his contract at the time of his being institutionalized on-screen, but Jason’s absence could still be a significant part of the story. It boosts Sam’s breakdown odds since she won’t have current Jason around to reassure her. Sam will lose her rock and she’ll probably wonder if Burton’s character is a figment of her imagination. Plus, the people of Port Charles can interact with Burton’s character without current Jason’s interference. They’ll be able to get a feel for what Burton’s character is like and decide what they believe. It should be difficult for anyone to figure out the truth. This also sets up the inevitable moment when Jason recovers and comes home to see his old face standing in front of him on someone else. It’s a good way to delay the epic shocker. General Hospital spoilers suggest that the double Jason storyline will play out in layers. GH wants to take advantage of every last bit of the drama!